Special Discounted Offer CLOSING NOW: Get In Before The Price Goes UP! I’ve been with Job Crusher for the past year and it has been one of the best decisions that I made for my business. Eric and Bill are the definition of ‘over-deliver’… They pour out everything from their hearts and truly want us to succeed more than anything. If you are looking to ‘Crush’ your job and stop chasing the ‘new shiny object of the week’ and build a ‘real’ business, DO NOT pass up on this awesome offer! I really love the job crusher program and it has helped me see results in my business after years of not seeing any results! I have to say that you will be kicking yourself in the teeth if you pass up on this tremendous offer! I jumped on their deal a month or so ago and my life is on a different path! Thanks Eric and Bill, I know that this offer will be outstanding! P.S. they tend to over – deliver on a major scale! I recently spoke at one of Bill & Eric’s seminars and the people wouldn’t stop talking about how much value they get from these guys. That’s a rare! Your in good hands on this. 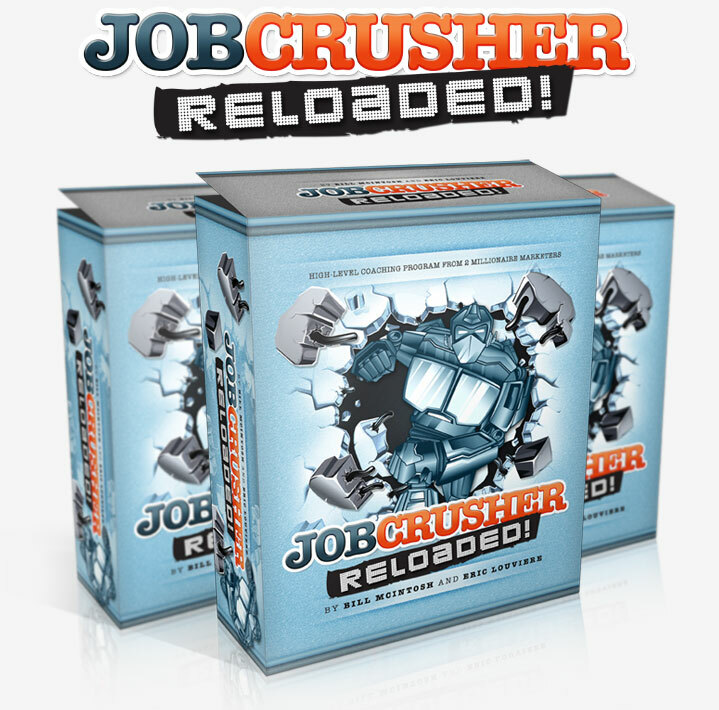 It gives me great pleasure to write a testimonial for Job Crusher. Because when if first started Eric was a consistent source of inspiration to me. I’ve learned an absolutely ton off the guy, both from paid products and the wealth of information he’s given away on the main forum. Put him in a team with Bill and frankly, that should be all you need to know to see that Job Crusher is an absolute must own. I have been a member of Job Crusher for a little over a year. 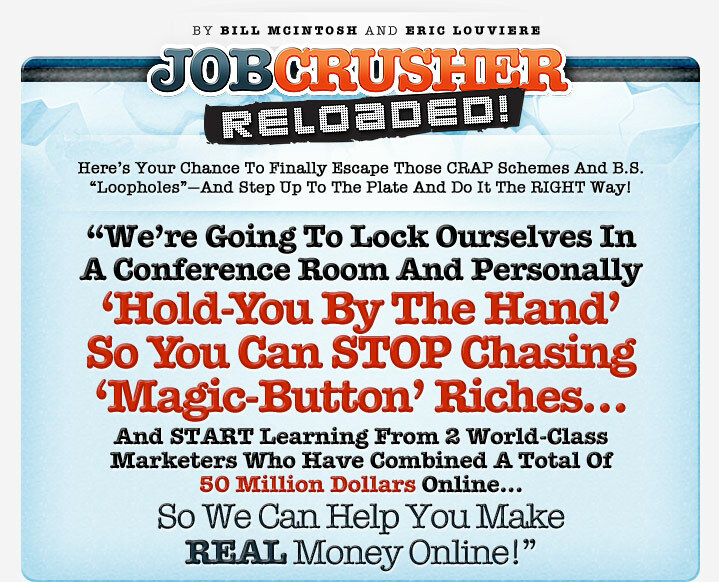 Within two months of joining Job Crusher, I was making a full time living online. I was just getting ready to give up, thinking that internet marketing was a scam. Before joining Job Crusher, I was managing a restaurant, putting in long hours. I quit my job, using my savings to live until I could find a way to make money online (something you really shouldn’t do). I stumbled around for the first year, learning and buying products that made huge promises but never delivered. Finding Job Crusher is the best thing that ever happened to me. It put me on the path I needed to take to make money. Inside Job Crusher, you can learn just about any type of marketing technique there is. However, becoming successful online is not about all those techniques, it’s about taking action. There are opportunities everywhere when you know where to look. Bill and Eric help you to seize opportunities and to take the necessary action. These guys know what they are doing and they don’t promise you push-button riches that don’t exist. They are the real deal and you really need to at least check out the site and poke around a bit to see this for yourself. I’m speechless. I’ve known Eric for many years and heard great things about Bill so when I got wind on the grapevine that they were getting together I was excited, to say the least. It inspired me because they literally leave no stone unturned so even a total newbie can finally make money online, sterling job guys! But it also SCARED me because the sheer QUALITY of what’s on offer and access to live group training means a lot of other marketers (myself included) are really going to have to raise our game in this industry. Again – brilliant product, I’m recommending it to every last person on my 100,000 list as an essential purchase. Hats off to Bill and Eric. I have to say that I signed up for this yesterday as a platinum member and I already know I made the right decision. There is so much valuable content and support. I have found a home at Job Crusher! If you are ready to take action to move your business to the next level, this is it. No more chasing shiny objects for me! I signed up, had to take a peak inside. I expected I’d be cancelling my membership as it takes a lot to impress me anymore but it looks like the massive amount of training inside and the live workshops are going to be well worth it. Great job guys. Anyone who knows me and follows my critical reviews knows very well I do not pull punches. All I can say is wow… One day was all it took me to figure out this is where I will be focusing and fellowshipping in the future. Pros: Well played boys… It’s all here in the members area. BONUS: access to membersnap is icing on a cake. Even though I can install wordpress and set up my own plugin based membership driven website in an hour, somehow I just have not done it. Having an instant membership site platform (think Kajabi lite) complete with pre-seeded sale and content components… Jeez. So to conclude. No offense to anyone but you may not see me here for a while… You know where I’ll be spending my daily learning time-slice. Just was at the first webinar training. Eric and crusher family did a great job focusing in one the biggest problem most of us face..focus! Focus on 1 system, 1 niche..I really liked “math = money” never thought of it that way..but it’s so true!. Everyone was very helpful and responsive to your questions. I look forward to getting into the course, learning and implementing. If you haven’t gotten in, then give it a try…what do you have to lose except great income potential! Pure platinum…and there are mountains of it “buried” inside the members area and then some. Heck, just a single site critique on live training session can be worth more than the whole year of membership payments if you just implement what they teach. Then you have the forum (multiple times worth of membership fees if you participate, like KEY said. ), membersnap (again, value = multiple times > than what you paid for) etc. … but the thing is, most people (especially in IM world) do not take the action no matter how well everything is served. It´s like the baby handing the candy but you refuse to try and take it because it might be too difficult…who knows what the baby can do to stop you! And as if that wasn´t enough, the crusher community is golden. There are tons of great people helping eachothers and striking JV deals, forming partnerships etc. (which is, again, alone multiple times more worth than you paid for!) The staff is really nice and helpful and you will always feel welcome when you enter to the Live training. New members are warmly welcomed to the JC family and their questions answered etc…and old ones has become your friends already. Listened to the Marketing Blueprint mp3s.. Really helped cleared the IM fog. I know where I got off track and what I have to do next. Regretting I didn’t pick up the upgrade. But I will work with what I have, which is plenty and bootstrap it. I haven’t been this enthusiastic about IM in a long time. Thanks Eric and Bill for actually making me feel hopeful again! I have heard nothing but good things about both Bill and Eric in the past, so I decided to get on board and take advantage of their Platinum offer. After the first training session this evening (8-22-12), I went away with a very positive feeling. All of the staff on the training and some of their long time members who attended as well, showed nothing but the highest interest in helping new members and over delivering on the content they provided. I guess it was like finding that one doctor you are paying for, that actually takes the extra time to get to know the real you and not the number you represent. Anyway, I really enjoyed the initial training and I look forward to learning more. Some people were just gifted to be teachers and I believe these guys and gals fit that mold to a tee. If you are considering this program, I would say that you have more to lose by not giving it a shot. I believe it will be worth more to me, then I will end up paying and then some! I only just joined up yesterday and have not had a chance to go through all of the material but I really like what I’ve seen so far,especially the mindset video by Eric.That’s one video I will be watching over and over again,if you want to be successful in IM then the real truth is contained in that one video. To be honest, my first impressions are that the Job Crusher crew are both savvy AND sincere.I sat in on the call last night (did you? ),and you couldn’t have wished for a more friendly,helpful and sincere bunch of people. I guess we all see things from a different angle and we all have an opinion,but I can only say that my first impressions are very positive. Not having a go at you,just giving my own unbiased view and I can absolutely assure you that I never genuflect or bend for anyone,with the exception of Bruce Lee,Pele and Muhammed Ali! Here’s the deal: Eric and I have been in Internet marketing for a combined 20 years. We’ve taught MANY of today’s big-time Internet marketers you’ll read about a little later. Right Now… And I Don’t Blame You! You see, the “big hitter” marketers out there didn’t get rich by buying $7 ebooks and $17 “push-button” software. We sure didn’t. And many have credited Job Crusher with changing their lives and providing them their starts…you’ll read about them in a second. Not to mention our high-level coaching program that others have paid up to $1,500 for and you’ll get access to for next to nothing! This is where the money’s at! You’re going to be blown away at what you’re going to discover here. One more thing: there’s no “negative Nelly’s” on this forum. We have a rule to keep things positive, fun, and helpful! Imagine getting a full-blown presentation from a multimillionaire who has built up a jaw-dropping income all from following a simple formula. You’ll hear from mindset experts, copy-writing and persuasion experts, millionaires, traffic generators, affiliate marketers, product creators, tech stars…you name it! This is a LIVE event…where we lock ourselves in a REAL conference room…and students can actually see our faces via live video stream. You see, many “newbies” get hung up on the “tech-y stuff” when it comes to building a site. 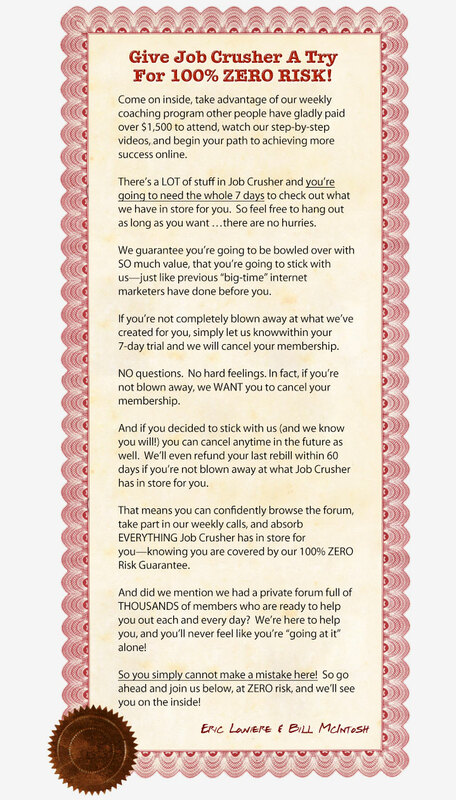 So we decided to save you the trouble and GIVE you your own membership site with your Job Crusher membership! ANY Time…So You Better Hustle Up! If you’ve read this far, you know what to do. Take action by clicking on the Add To Cart button below…or risk getting shut out forever! We made sense to you. We did not did not pander to simple greed or foolish lust…or promise some kind of easy magic bullet or “loophole” that promises push-button riches. • We promise to provide you with all the information you’ll ever need to build a real online business so you can quit your job and earn six figures from home. • We promise to treat you well, to treat you how we’d like to be treated… and we promise to not lie to you or to give you false hope or empty promises. • We promise to keep you updated on the latest information, cutting-edge techniques and changes to the net. • We promise to give you everything we’ve got for earning a full-time, six figure income, online from home! • We promise to not abandon you, or this dynamic program. We plan on being here for a very long time to come…as we have the past 6 years…and Job Crusher is our full-time home! So if your ready to step up and get serious about making money online, then you know what to do: Click on the Add To Cart button below to get started! You see, most Warriors who browse and purchase WSO‘s are “pretenders”. They buy the $7 eBooks and store them on their hard drives—just waiting for the perfect time and place to “get around to it someday”. You’ve seen the overwhelming value we’ve presented to you in this letter. 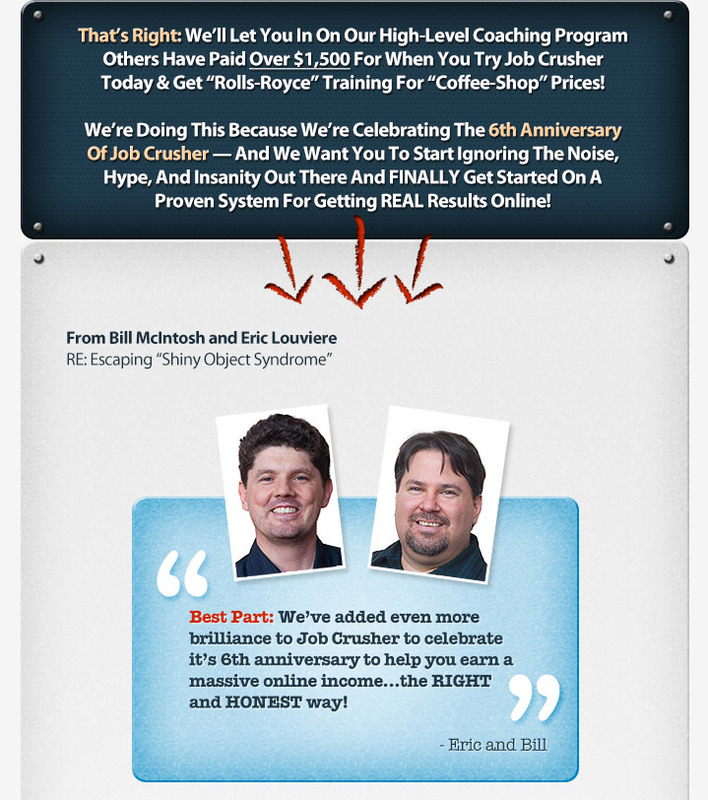 You’ve seen the testimonials from today’s Internet marketing “heavy hitters” who got their start with Job Crusher. • Get exposed to a PROVEN money-making system 6 years in the making, 15,000 customers, and 50 million dollars worth of money-making experience. • Go go back to “things remaining the same”. Getting the same results, keep “spinning your wheels” with “shiny objects” and gimmicks, and remaining stuck forever. We’re just asking you to click on “Add To Cart” Below and let everything we’ve prepared come to you to explore for 7 days.